Welcome to Rochester Party Bus! Rochester, New York is a gorgeous city that has it all. Beautiful parks and views, a vivacious downtown, fantastic restaurants and bars, a great education system, and dozens of festivals are just a few things that you can experience in. We are in the thick of it all and we would love to show you all the exciting sights that our city has to offer. We transport Rochester's hardworking residents and visitors through the heart of the city and beyond! Featuring a fleet of amazing party buses, we are here to provide you with luxury and entertainment. Each vehicle features hardwood floors with dance poles, flat screen televisions, state of the art audio systems, custom color changing lights, granite bars, and plush leather perimeter seating. You have to see them to believe it! Want to come look at them? Please do! Or simply take a look at our fleet page from the comfort of wherever you're at right now. We price our service fairly at rates that everyone can work with. We do honest business, and never charge hidden fees or extra charges that you are unaware of. We believe that customers are key to any business, so we treat them with respect. Each employee is courteous, helpful, and can answer any questions you may have. Have you ever had the pleasure of traveling in a party bus before? No? If you're new to the scene, we'd love to be the company that introduces you to this experience. It's the utmost luxury on the road, just like having your own private night club on wheels! Did you know that a party bus features a built-in bar for your enjoyment? We stock it with ice and cups for you before your outing, so all you have to do is pick up whatever beverages you prefer. Alcoholic beverages and more than welcome and one hundred percent legal too! Why? Because you'll have a pro chauffeur at the wheel all night, acting as your designated driver and keeping you completely safe on the road. In addition to those beautiful bars, we also feature high tech entertainment features that vary from bus to bus. These generally include such exciting things as large screen HDTVs, booming stereo systems with smartphone hookups, and color-changing lighting! And that's just for starters. Your entertainment is so important to us, and we want to make sure that even if the event you attend ends up being a snooze fest, your time on the road with us will still be a blast! Another perk is our cozy plush seating. Look at our fleet page to see the way that the seats are arranged. That set up means that you will be able to chat it up so comfortably with your guests, rather than trying to lean into the back seat of a cramped car! You can even stand up and walk around, stretch those legs when on the road! You can bump that music loud and dance the night away if you like! It's a real party every moment that you travel with us, getting more and more value for your money because you're maximizing your party time! Browse our website to learn more about our company. When you're ready, give us a call for a quote, to make a reservation, or for anything else you might need. We look forward to working with you! We are also available to work with you for other trips that are not within our service area. If you're in need of service in the midwest check out ChicagoPartyBus or Southfield Party Bus. This 20 passenger party bus is perfect for smaller groups that are looking to have a great time. It has a white exterior that makes it great for all occasions! This classic white party bus is large enough to accommodate up to 30 passengers! It is great to transport larger groups around Rochester. At our Rochester Limo Service, we want to please our customers. That is why we offer the lowest prices possible while still maintaining an amazing fleet of party buses. You will find that our rates are competitive with other companies in the area, but our service is above the rest! We want to please our customers. That is why we offer the lowest prices possible while still maintaining an amazing fleet of party buses and limousines. You will find that our rates are competitive with other companies in the area, but our service is above the rest as far as how we treat our clients and the vehicles we provide. We'd love to hear from you on the phone to talk about the ways in which we can save you more money when you travel with us. Where other companies are all about the bottom line, we are all about building real relationships with loyal customers. Spending a fortune with us once is worth nothing. Coming back to us time and time again for all your special eventS? That's where our real enjoyment is. Let's meet today and plan that party! Rochester is home to many festivals throughout the year, mainly in the spring and summer. Enjoy parades, music, films, vendors, drinks, and more! There's no better way to get to each festival than by a Rochester Party Bus. Super comfortable travel on the way there and such a smooth ride home. Your wedding day is approaching fast, and you are going to need transportation. Let us take care of it! Our party buses feature limousine style interiors that add class to any event. Special wedding day packages add more class and sophistication to your trip! Your teens looks forward to Prom and Homecoming all year, so why not make it special? 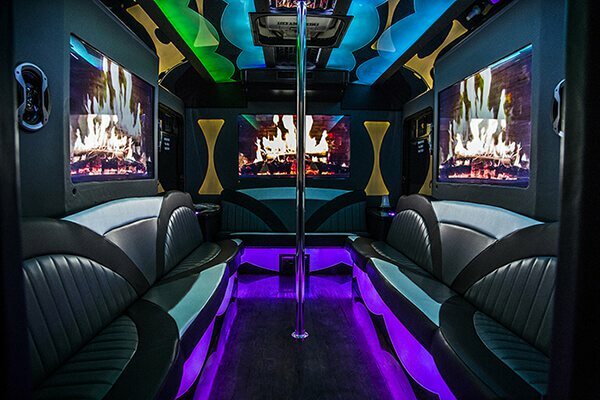 Book a party bus for their group, and they will be the envy of every student! Plus, you'll know that they're totally safe all night long. We love giving you a worry-free night!